GRAMMY AWARD Nominated Children's Singer/Songwriter. Performs for all types of children's venues including schools, libraries, festivals, private parties. All music is original upbeat, fun, and interactive. Shows can include the full PapaHugs Band, or be an acoustic performance. Shows also can include many costumed-characters to go along with the music. Lots of fun give-aways are provided to add to the entertainment. 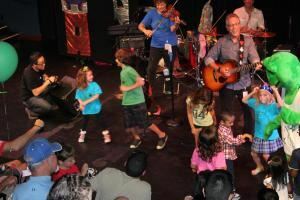 Our target age group is 7 and under, but the music is enjoyed by the entire family.